I sometimes wonder what others see when they look at something I have painted . . . In 2016, I made a personal commitment to support as many local art competitions as I could through participation. One of those local competitions was Lynda English Studio's Miniature Competition. And this evening the judge shared comments on the pieces she selected. This little mini was the delighted recipient of 2nd place! But this is what struck my core this evening. 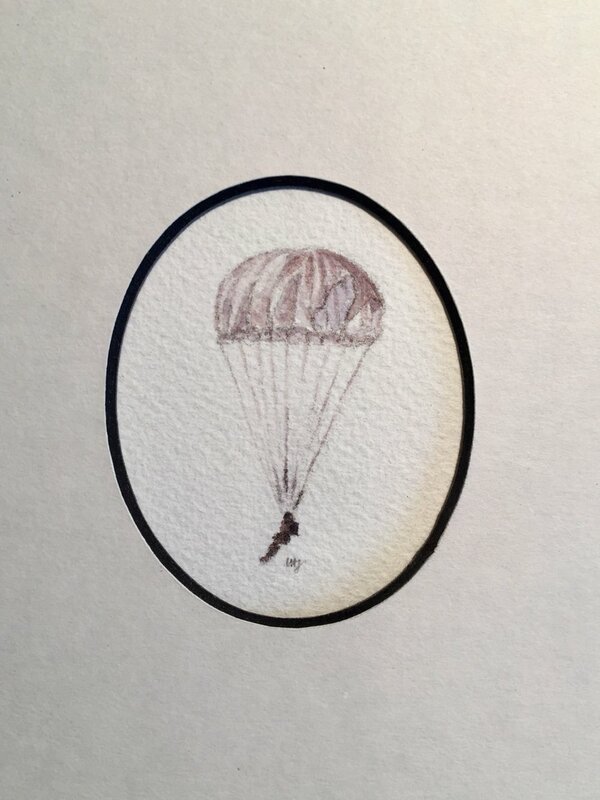 The judge said the delicate lines within the parachute reminded her of the frailty of life. What she didn't know (and what I couldn't tell her because I would have cried!) - is that this is actually a painting of my father, painted from the image at the right. He died when I was 8 years old. At that age the frailty of life became a reality to me. And just today my heart has been aching for a friend who is facing the same. It doesn't matter what age you are . . . they will always be Daddy. And so to me courage means many things. It means those that serve fearlessly with bravery. But it also means those that continue to take one small step at a time. Or those that take a leap of faith and jump. Courage means my mother who chose to stay in the United States to raise her three girls, - rather then return to her country of Germany because she felt it would be best for us to grow up here. It also means my grandmother - who as my sister points out is the original steel magnolia. If you know her, you know this is true. And I know God has not given us a spirit of fear. But it does like to sit on our doorsteps. Then this captures my heart and I have to agree. My sister gave this to my oldest boy when he turned 16. A photo of our dad in his glory days. So here's to courage! And the beauty of life. A special thank you to Kim Brauss for her kind words this evening. Kim, you saw exactly what my heart painted into that little piece. Thank you to Lynda and Jackie for supporting local artists this evening, both young and old!